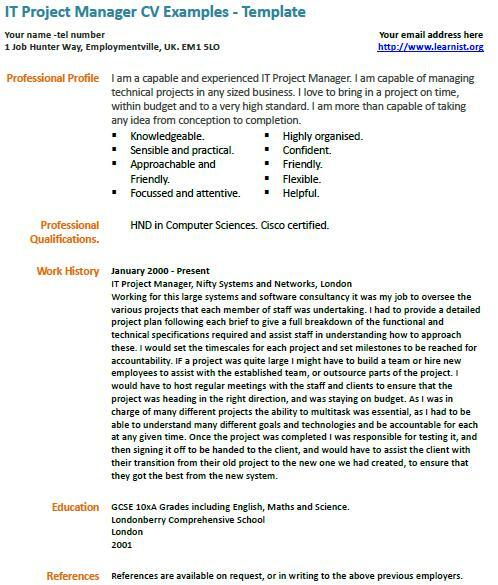 IT Project Manager CV Examples – Template. Amend this CV sample as suitable and write your own CV in minutes. This CV example is fully editable and free. I am a capable and experienced IT Project Manager. I am capable of managing technical projects in any sized business. I love to bring in a project on time, within budget and to a very high standard. I am more than capable of taking any idea from conception to completion. HND in Computer Sciences. Cisco certified. Working for this large systems and software consultancy it was my job to oversee the various projects that each member of staff was undertaking. I had to provide a detailed project plan following each brief to give a full breakdown of the functional and technical specifications required and assist staff in understanding how to approach these. I would set the timescales for each project and set milestones to be reached for accountability. IF a project was quite large I might have to build a team or hire new employees to assist with the established team, or outsource parts of the project. I would have to host regular meetings with the staff and clients to ensure that the project was heading in the right direction, and was staying on budget. As I was in charge of many different projects the ability to multitask was essential, as I had to be able to understand many different goals and technologies and be accountable for each at any given time. Once the project was completed I was responsible for testing it, and then signing it off to be handed to the client, and would have to assist the client with their transition from their old project to the new one we had created, to ensure that they got the best from the new system.